Those who have read the first two in this series will find many of my favorite characters return with this one, such the feral Beaumont brothers from the second book. Then, there’s Jack, Isabel’s love interest and the owner of the Rooster Bar, plus the Old Farts, those nosy old men in the general store’s backroom, and those rough-and-tumble cousins, Marsha and Annette. But I’ve dreamed up several new characters for this one, including a character Isabel calls the Big Shot Poet. I even made him a suspect. Interested? Then get thee to Amazon. Today I received a copy of the paperback for Redneck’s Revenge, the second in my Isabel Long series. As my friends in the UK would say, I am chuffed. Yes, I am pro-eBook. It’s a great way to find a new read or a new author without investing a lot of money. But there’s something special about seeing something you thought up finally on paper. For Kindle fans, Redneck’s Revenge is ready for pre-order. Click now and it will pop into your device Sept. 26. Books start with an idea. In my case, it was: I’m going to write a mystery with a woman protagonist that’s set in a rural area. The other day I found a notebook with a page of notes about the book. The protagonist’s name is Isabel from the start. She loses her job managing a newspaper. Her husband walks out on her and takes half their money out of the bank on an icy day. Her mother moves in with her. Isabel gets a job at a local bar, where an old coot approaches her about his daughter who disappeared a long time ago. That was in September 2016. I worked on Chasing the Case (not the original title) during the winter of 2017, when I lived in New Mexico, and finished it in the spring. The story changed. Isabel’s husband isn’t a cad. I bumped him off instead. Isabel does work part-time in a bar, but her first case turns out to be her first big story as a rookie reporter — the disappearance of a woman 28 years earlier. Her 92-year-old mother becomes her Watson. I enjoyed writing Chasing the Case so much, I wrote a sequel — Redneck’s Revenge — while moving to rural Western Massachusetts, where this mystery is set. Redneck’s Revenge is my latest book published by Crooked Cat Books, which took a chance on the series late last year. I knew my copy of Redneck’s Revenge was arriving via the U.S. Post Office today, so I dashed out of the house when I heard the mail truck stop at our box. I tore open the envelope. Those who have read the first — and thank you — will find many of the same characters make it into the second. Of course, there’s Isabel and her mother. Look for Jack, the Old Farts in the back room, and a woman that Isabel nicknamed the Floozy, who is one of the links to her next case. Then there’s a whole bunch of new characters since this murder mystery takes place in another fictional hilltown in Western Mass. Intrigued? I hope you are enough to want to read it. ABOUT THE PHOTO ABOVE: Yup, that’s me holding my new book. Monday, Feb. 20, the official launch day for The Sweet Spot, fast approaches. For the past couple of months, I’ve been trying to generate interest in my hilltown novel’s characters and plot. I will continue that practice over the next few days via these posts. The Kindle version was a bit trickier. But Michelle figured out the formatting problems. Then I had to come up with ad copy through Amazon marketing for the Kindle version. I plan to run the ad for the next two weeks at least, starting Monday. People were nice enough to weigh in on the ad copy on Facebook. Ah, then I found out I had to reduce it all to 150 CHARACTERS. Wow, how do you reduce 80,000 words into that amount? Here’s what I came up with: Most love Edie, widow of a soldier killed in Vietnam, until her affair with his brother ends badly. Can she survive her small town’s biggest scandal? That will appear on certain ads, like when somebody opens their Kindle e-reader. I also came up with a headline for the other types of ads: Secrets and Scandals in a Small Town. Of course, I will do promotion via social media, and later next month, a reading in Taos. It would be fun to return to the hilltowns of Western Massachusetts to have one. And hopefully, those who read and like my novel will write reviews as they did for my last novel, Peace, Love, and You Know What. 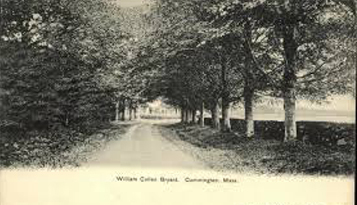 ABOUT THE PHOTO ABOVE: That image of the road leading to the William Cullen Bryant Homestead in Cummington, Massachusetts was taken from an old postcard. Hank and I used to walk the old-growth forest beside it when we lived in the hilltowns. Conwell, the fictional town in The Sweet Spot, would fit nicely beside Cummington.